Rarely do I find myself excited about a local release. To tell you the truth, most of Israel’s prog-metal output has been mediocre. Orphaned Land‘s celebrated status (the famous “Mabool” album) comes from the ethnic-metal label. So far, most of the Israeli progressive metal groups hadn’t produced an impressive debut. But times have changed for the better. 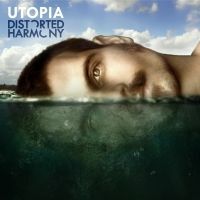 Distorted Harmony‘s album, which was released for free at first (it costs 2.5$ on BandCamp), is one hell of an album. Yoav Efron‘s musical production and keyboard stunts have risen to the international standard. The combination of orchestral samples and a ‘live’ rock band has been worked out beautifully, for a change. I find myself enjoying this album again and again, quite a feat, considering the fact that very few Israeli prog albums are “fun” in the most basic proggy sense. It all starts from the basic drum sound (drummer: Yogev Gabay), which is up to par with DT and POS. Then follows a great guitar sound (Guy Landau) and a pretty decent vocalist (Misha Soukhinin), featuring a nice English accent (don’t take that for granted). Musically, DH is working in the boundaries of the Dream Theater and Pain of Salvation sound-world. You can also hear traces of other bands, such as the Polish group “Riverside“, Sweden’s “Therion” and “The Mind’s Eye“. Basically, if you like aggressive prog-metal with a symphonic edge, you’re gonna want to download DH’s debut without thinking more than twice. Although originality is not the leading feature of these specific six tracks, clocking in at a total time of 54 minutes, you can find a high level of attention to detail, fine singing, sensible lyrics and some pretty cool orchestral (sampled) arrangements. Almost none of the musical shticks is really new to the well-trained prog-metal ear, but they are cleverly remade here, with catchy hooks and majestic melodic vocal lines to support the project. Final important credits, beyond the obvious ones to the project leader, Yoav Efron, go to two people who have mixed and mastered this lovely record: Jonathan Barak at Sonic Studios (mix) and Jens Bogren at Fascination Street Studios (mastering). Without these two tech wizards, even the greatest album can sound like a piece of unlistenable, amateurish crap. These guys are going to play this music live on the upcoming ProgStage 2012 festival, supporting respectable progressive rock names such as POS, TFK and Anderomeda. Israel proggers should be really proud of DH, joining a global community of prog-metal heads. This entry was posted in israel progressive rock and tagged distorted harmony. Bookmark the permalink.